Description: Photograph copyrighted by Nautical Research Group that shows a close-up shot of the bow sprit of RMS Titanic. In this photo, you can see the growth of rusticles on the ship. These rusticles are highly developed communities that are by-products of bacterial microbes that are consuming the steel of Titanic. 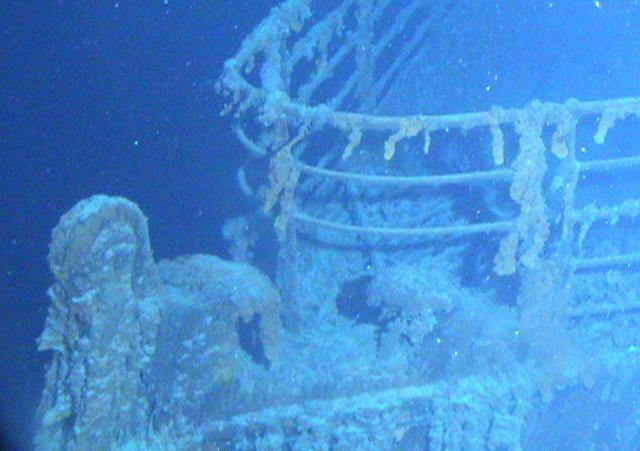 You can not see the individual microbes but you can see the plankton in the water that we feel might play a pivitol role in the microbial decay of Titanic.